Used to protect chairs, couches, curtains, wall coverings & hangings, paper & wood. FlameShieldä Proprietary fire retardant formulation effectively retards ignition and the spread of flames on natural and synthetic fibers and fabrics. 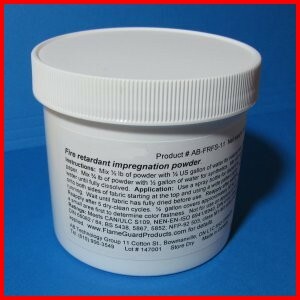 User mixes the impregnation powder with water at the ratio of 1 Lb (455g) of product per gallon of water for natural fabrics and 1.5 lb of product per gallon for mixed and synthetic fabrics. May also be used on paper, cardboard and non-painted wood surfaces. 1 gallon of mixed formulation covers approximately 100 sq ft of material. The mixed solution can be sprayed easily using a pump bottle obtained from most large department retailers or garden centres. Ensure that the pump bottle is appropriately labelled. This formulation is not suitable for application onto non-woven and woven plastics such as polyethylene tarps or groundsheets as those materials do not absorb the formulation. Not for use on apparel, garments or workwear. The resulting mixture is a tested “A” Class Fire Retardant spray for curtains, fabric and upholstery,and meets CAN/ULC S109. Also meets NEN-EN-ISO 6941/6940; DIN 4102, class B1, B2; DIN 66082 / 84; BS 5438, 5867, 5852; NFP-92 503, class M1-M3. Items washed must be re-sprayed. Items dry-cleaned must be re-sprayed after 5 dry-clean cycles. Available in 1 pound (455 gram) jars, 5 pound cans, 20 pound pails and larger quantities.